There isn't a one shoe fits all solution to resource planning. Every single team is using different approaches even if they are using the same resource planning tool. Some of you like to plan specific daily assignments for each resource. Some of you just need to book resources for projects to know who is available and who isn't. While planning resources for some projects you really need to get in there and do the dirty work, for other projects you can plan general tasks. Sometimes you need the bird's-eye view. Sometimes you need to zoom in. That's why navigating in a Gantt chart based resource planning tool's timeline should be easy. And in Ganttic, it really is. The options you have made on the timeline navigation toolbar cannot be saved. However, you can choose a default time period. Timeline navigation options should be used on the go for a better overview. Below you'll also see all the tasks planned for that year. You'll also see all the tasks planned for that month. You'll also see all the tasks planned for that week. You'll also see all the tasks planned for that day. You'll find them on the right or left of the year, month, week or day. 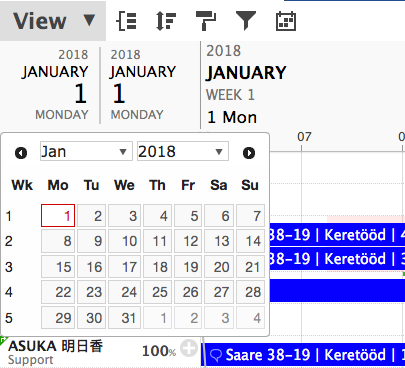 Set the start date in the left calendar and the end date in the right calendar that will pop up. Did not find the answer to your question regarding timeline navigation?